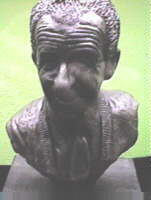 To celebrate the 40th Anniversary of The British Comedy Society in 1998, four pewter busts were auctioned of and went for in excess of £300 each. These originals resided in the MOMI exhibition until the auction. Eventually reproductions were made of them for £65 each.